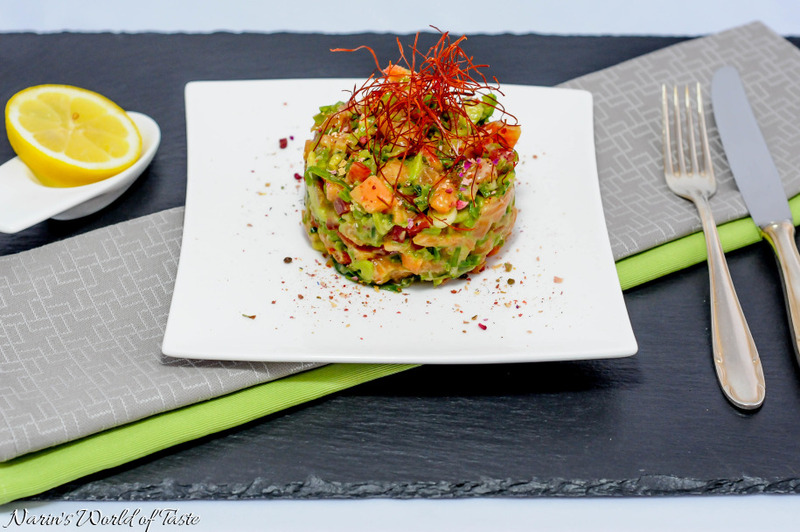 Salmon Tartare is one of our favorite starters, especially during spring and summer time. 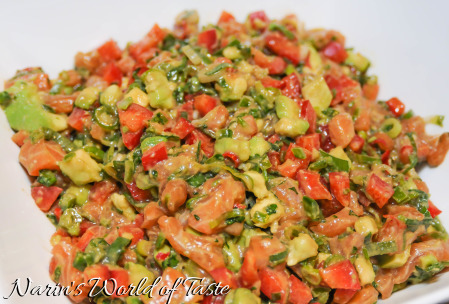 It’s easy to bring in different flavors from cuisines around the world. This time I wanted to add a crunchy texture and a touch of Asia, so I added a few extra ingredients like avocado, bell pepper, and snow peas. 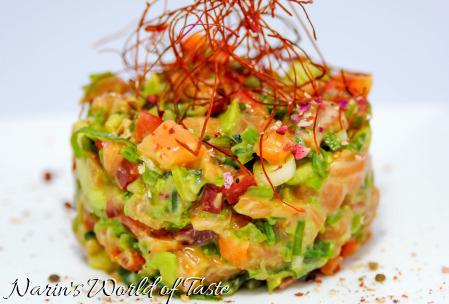 The crunchy texture of the bell pepper and snow peas make a great combination with the creamy avocado and salmon. Wash the spring onions and cut both the green and the white part into small rings. Peel the avocado and dice into small cubes. 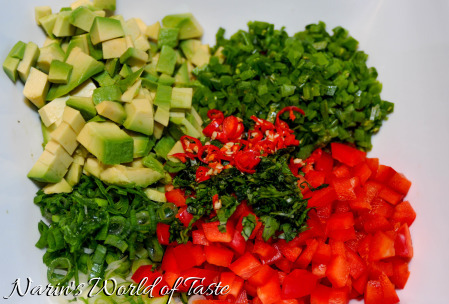 Wash the bell pepper and dice into very small cubes as well. Wash the snow peas, coriander, and chilies, and chop very thinly. We like it spicy, and I often use the entire chili including the seeds. You can leave out the seeds, use less/fewer chilies, or leave them out altogether – or, of course, you can add even more. Cut the sashimi-grade salmon into medium size cubes (about 1.5 cm on the longest edge), and make sure all bones are removed. Using a reasonably sized bowl or Tupperware, combine the salmon with all the other ingredients from above and season with sesame oil, soy sauce, lime juice, and salt to taste. Toss and stir until everything is mixed thoroughly, then let the mixture rest in the fridge for at least an hour before serving. To serve, if you have food forming rings, this is a great opportunity to use them. Else, use a normal table spoon and arrange nicely. To garnish, you can use chili threads (like I’ve done here), sprouts, dried flowers, or anything else you wish.